Ratchet and Clank Trilogy coming in Fall 2012! Just pulled this information from Wikipedia and I can't wait to buy both of these! For those that don't know, I'm a big R&C fan! 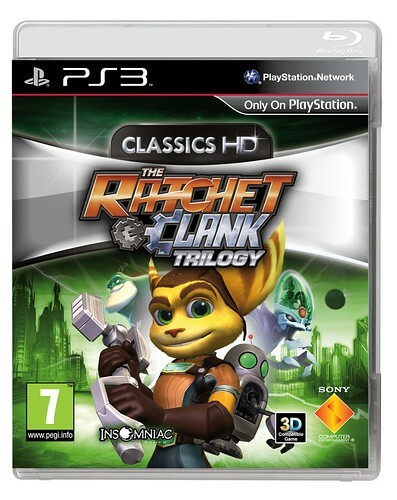 The Ratchet & Clank Trilogy (known as Ratchet & Clank Collection in North America) is a video game that contains high-definition remastered ports of thePlayStation 2 games Ratchet & Clank, Ratchet & Clank: Going Commando, and Ratchet & Clank: Up Your Arsenal for the PlayStation 3 on a single Blu-ray Disc as aClassics HD title, published by Sony Computer Entertainment. The games were originally developed by Insomniac Games, who have assisted in the remastering alongside with Idol Minds to provide support for high-definition monitors, higher frame rates, stereoscopic 3D, and additional features for the PlayStation Network. The HD collection was released on June 29, 2012 in Europe and will be released in Fall 2012 in North America. On the 3/5/2012 a new classic Ratchet & Clank game was announced titled Ratchet & Clank: Q-Force, also to be known as Ratchet and Clank: Full Frontal Assault. The game will be released in Autumn 2012. The game will see the return of the classic third person camera used in the original games, and features a co-op option. The game was announced as part of a 'surprise' from Insomniac Games to mark the 10th anniversary since the original game was released. The collection was officially announced by Sony and Insomniac Games on 15 March 2012. The collection includes the original trilogy in remastered 1080p and 720p Stereoscopic 3D support. It also includes the multiplayer of Up Your Arsenal over the PlayStation Network, as well as full trophy support as well as one Platinum trophy for each game. Insomniac Games announced during the reveal of the Collection that there will be worldwide surprise for the 10th anniversary of the Ratchet & Clank series. This was revealed to be the release of Ratchet & Clank: Q-Force. Moreover, to compensate for the gap in between the PAL and NTSC releases, North American fans will also receive another surprise. More infor on this European Playstation blog.